A typical Anglo-Saxon family?A typical Anglo-Saxon family? 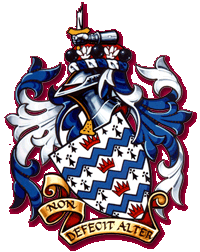 This website was launched in 2004 to mark the publication of the Stainforth family history 'Not Found Wanting' by Peter Stainforth, which shows our family to be an archetypal English mixture of soldiers, clergymen and farmers, butchers and wine merchants, as well as several more illustrious personages, such as several MPs, a Lord Mayor of York, a Keeper of the King's Manor, a Proctor for Northumberland, and the first man to fly over 400 mph. In the course of research in 2015 for a biography of air speed record breaker George Stainforth AFC, author Gordon Stainforth has made some major amendments to some of the captions in the image Galleries.